5 Days a week I make Emile’s lunches. It is not a chore for me really, in fact, I find it a bit of a challenge for myself to include variety, low calories, high fibre, protein, interest and bulk. That is difficult. 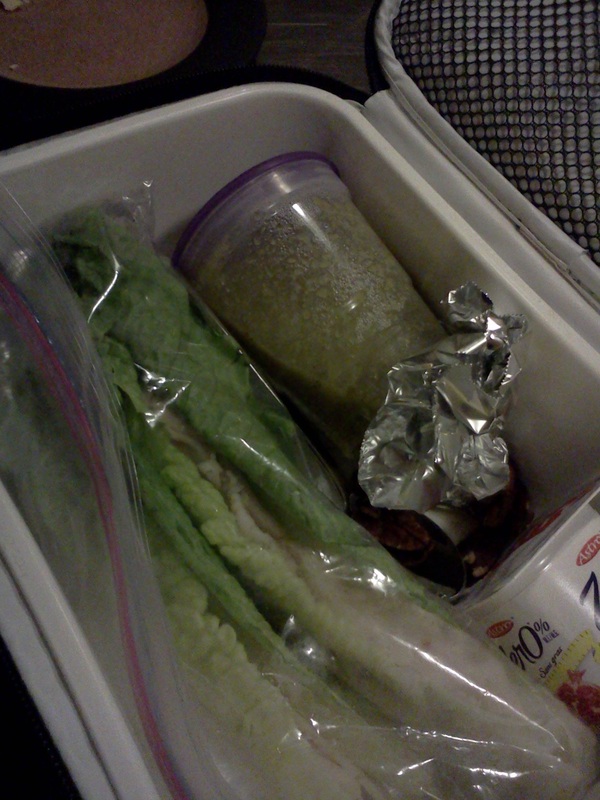 I have a friend – who will remain nameless so she can avoid persecution – that refuses to make her husband’s lunches. She doesn’t want him to become dependant on her for food. She manages the rest of the house and the family – he can figure out eating breakfast and lunch. That’s fair I think – and frankly if I had less time on my hands, I too would probably expect that we would take turns. 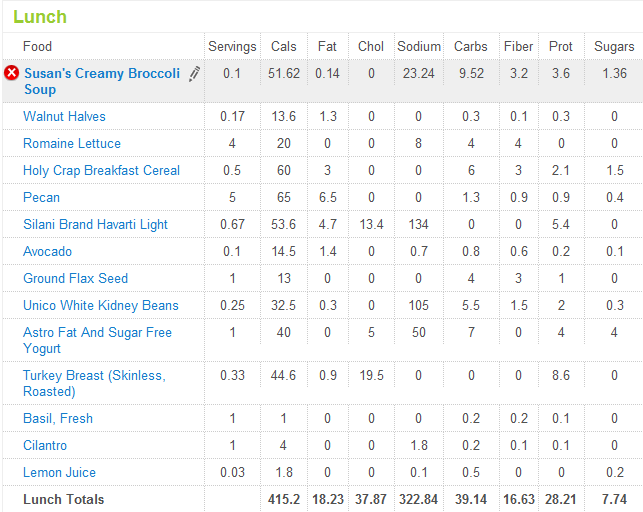 Today’s lunch (to eat on Monday) I am pretty proud of. It has homemade broccoli & bean soup with added ground flax seeds and nutritional yeast flakes; two romaine lettuce sandwiches featuring homemade pesto (like I couldn’t make that again), sodium nitrate free turkey breast from Well Fed, and light Havarti cheese; low-fat yogurt with 1 tbsp Holy Crap cereal; and a couple of pecan halves. I’ve learned that Emile likes his lunches when they good for grazing. He can have the yogurt in the morning, eat the “sandwiches” atlunch, and nibble on the pecans in the afternoon. He doesn’t really want last night’s leftovers because he just eats them all at once and there is nothing left for the afternoon when he gets hungry. April 22, 2012 Extra-Ordinary: Making a lunch to be proud of – like millions of Moms, Dads and spouses across Canada. Emile and I rarely go out for dinner as of late. We are on a loose budget and we are working hard to make April as Fit as possible. In general, those two things do not mesh well with dining out. After work today, Emile and I met up at the Summit Center for a run. I had already done two – TWO! – bouts of exercise that day for a total of 1 hour and 40 minutes, plus working around the house (painting and sanding, etc). So, then on top of that I went running for 3k. My shins hurt, I was tired and I simply could not face going home to have a vegetable stir fry with riced cauliflower and meatless crispy tenders. Emile said he would make it, but I wasn’t buying. I wanted to go out for dinner and I had the calories to spare! I suggested we head to 3 Guys and a Stove. Emile agreed as he hadn’t been there in years. Off we went – but he turned left when he should have turned right. Turns out what I say out loud and what I am thinking are two different things. So, we ended up at Tall Trees instead – because that is what I said – even if it wasn’t what I was thinking. It was no sacrifice – believe me. April 20th, 2012 Extra-Ordinary: Some else made me a perfect Filet Mignon with delightfully cooked vegetables. Presumably they even washed up. There are some nights when dinner is tremendously unsatisfying. And there are those special nights that you create something that is so fantastic that you can barely believe that you are a Materials Manager and not a celebrated chef. Last night was such a night. I made pizza. But not just any pizza. This pizza started two nights ago when I was craving pesto. But your average pesto has pine nuts, olive oil, and parmesan cheese, and that usually adds up to 250 calories for a 1/4 cup. More than we could afford in Fit April. Undaunted, I hit the internet for some ideas. When I typed in “oil-free pesto” I got thousands of hits. Weirdly, most of the top results were Vegan oil-free pesto. I guess the vegans don’t want oil either. and cilantro seasoning (a tube of cilantro paste with other seasonings that I had lying around – don’t know how much it added to it, but glad to be using it up). Just throw everything in your food processor. Done. Serves about four. The first night we had the pesto on Tofu Shirataki noodles and steamed broccoli coleslaw (all tossed together). I sprinkled some parmesan cheese on mine, Emile went without. It was delicious and the total dinner was 250 calories. But now I had this 1/2 recipe of pesto in the fridge. What could I do? Well, I made pesto pizza. I had some left over tofu which I marinated with balsamic glaze and dried oregano, 1 chicken breast cooked in a spicy tomato based sauce, red peppers, low-calorie pita bread cut in half (to make 2 rounds, not pockets), parmesan cheese, red onions, and of course, mushrooms and tomatoes for the boy. Put them together, broil for 3 minutes and hello! We ate it so fast that I couldn’t have taken a picture of it even if I had thought of it. Two pizzas each and only about 350 calories total. I am so good. Want some now. Sigh. . . no left overs. Last time I bought mushrooms, it must have been from the oompa-loompas because they were gigantic. In fact, for Emile’s two pizzas, he only used 1 mushroom. That left just one mushroom which I threw into the fridge. I was reviewing our calories intake for the day and noticed that with Emile’s low-calorie lunch and dinner coupled with his 5k run, he had not consumed enough calories for the day. I told him he should eat something else. He was annoyed by this. Well, actually he was annoyed by this because I told him twice.. . well. . . maybe three times. He said he would get something to eat later. Later that night, Emile pulled out that lonely mushroom, removed the stem, put probably .25 ounces of old cheddar cheese in it, turned on the broiler (apologized to me for wasting energy), and broiled his single – albeit large – stuffed mushroom. Um, yeah, 28 calories wasn’t exactly what I had in mind, honey. April 18th, 2012 Extra-Ordinary: Making the pizza of my life. Watching my husband’s single-mindedness focus on Fit April. Today I binged. No, I didn’t bing. I binge-d. I was at the grocery store and I noticed that Cadbury Mini Eggs were on sale for $.49. I love Cadbury Mini Eggs. I picked up the package of the eggs and noted that each package (which are getting smaller and smaller) had 180 calories. Considering now I can eat only 793 calories a day (if I don’t exercise), that is a significant portion of my daily intake. I had a couple of choices: I could skip on by without buying, smugly noting my extraordinary willpower. I could buy one package and share it with Emile when he got home from work (thinking the divvying up would have been a little lopsided). I could buy a package, take a run, then eat them all. I could buy two packages, take a loooong run, then eat them all. In November 2007, I contracted tonsilitis. It started Monday am while I was at work. I just didn’t feel good, and I knew in my bones that I was really sick. Not a flu, not a cold, but sick. Emile was not a supportive as he could be at first – while at least that is how my illness addled mind remembers it. It wasn’t until I went to the emergency room on Tuesday at 2 am because I thought my throat was going to close up, that he understood how sick I was. The doctor on duty immediately diagnosed tonsilitis and prescribed medication. He told me to stay away from people, sleep, eat and drink when I could, and avoid caffeine. At that point I was addicted to both caffeine and diet coke. I couldn’t get rolling in the morning without the hit and I would drink up to 4 or 5 cans of diet cola a day. As I couldn’t possibly imagine feeling any worse than I did, I decided to stop caffeine and diet coke right then and there. The headaches and irritability were nothing compared to the tonsilitis. And since then, I have not drank a Diet Coke and generally I drink decaf tea. (although while I write this, Emile is making me Earl Grey full-bore tea). There is two exceptions to this: When we were in Europe, I wanted to try Coke Light and see how that differed from Diet Coke. (I had a sip of Emile’s) And once someone complained about the Diet Coke when I was serving, so I took a sip to try to figure out what the problem was. In its place, I drink tea, soda water, water, or sometimes other diet drinks. So, faced with the flaming desire to eat Mini Eggs until I was sick, I instead headed to the pop aisle. I bought a 2 litre of A&W Diet Root Beer. And I drank it all in 4 hours. Yes, 2 litres of Diet Root Beer. (Well, that is a lie for a better story. There is in fact 1 glass remaining). Sugary sweetness. Carbonated goodness. As I lay there bloated, burping and well . .. honestly a little out the other end too . .*blush*, I felt pretty good. April 13th 2012 Extra-Ordinary: Afterall, I didn’t buy those damn Cadbury Mini Eggs. Today I visited Kitchener for a food show. It was not for the public, but rather for customers of a particular restaurant food supplier. No, I haven’t decided to open up a restaurant, but rather I attended with a friend who does own a restaurant (Well Fed in Gravenhurst). I haven’t been to Kitchener-Waterloo for a very long time. In fact, I think the last time may have been a bus trip to Oktoberfest when I was at McMaster University for my MBA. We rented a school bus – god those are terribly uncomfortable, why do we treat our nation’s children like this? – but I am not sure why we had to drive from Hamilton to K/W to drink beer as plenty was consumed on the bus. In fact, so much that we had to make an emergency pit stop on the side of the road for some gentlemen to relieve themselves. Needless to say, they did not get the privacy they likely desired as we all hung out the windows heckling them while cars whizzed by on the other side. (no pun intended). I may have visited a supplier there once too, but I cannot remember which one or why I was there. Isn’t it interesting how you think you’ll never forget all of this stuff, and you totally do? The food show was interesting for me. It’s fascinating to see how much of the products are pre-done for restaurants. You can buy pretty much anything you wish – already made for you. Usually it arrives frozen, you just defrost and sell. Which really takes the romance out of it for me. I like to think about the chefs and cooks across our land cooking and baking everything from scratch, with love in each stroke and cut. All of this pre-done thing was disappointing for me, but definitely understandable. It isn’t feasible – do you pay a chef for 4 hours to prep the veggies for dinner service or do you buy them already done? Do you make vegetable broth by boiling your leftover veggies for hours or simply buy it from someone who has already made the effort and even condensed it into a bowl? Bake your own cheesecake or simply buy one of the many pre-made desserts? With the narrow margins in restaurants, most simply cannot command the price that all the absolutely from scratch would cost. Best thing I tasted today is the Red Velvet Cake from a rep that had a mullet and bit of a belly. It was VIVID red with cream cheese icing. I haven’t had any sweets for a while and this for the first taste of cake in 3 weeks. It was delicious. So sugary, so sweet, so sticky. I would have eaten 16 sample pieces if social grace had not prevailed. I asked if they got the bright red colour from beets or red food colouring. He seemed taken aback and almost sheepishly said “Red colouring”. That’s a shame, don’t you think? I mean Red Velvet Cake is not supposed to be vivid red – it is supposed to be brown with a deep red tinge to it. The red (anthocyans) was naturally occurring when vinegar (acid) mixed with unprocessed cocoa. Once the Dutch ruined it with their new cocoa processing techniques, the new more alkaline cocoa didn’t react red like it used to. So let the dying begin! This particular sample was white cake dyed dark red. And it reminded me when I worked at Dairy Queen 20 years ago. The supplier had to control the amount of red gel icing we purchased to decorate ice cream cakes because red dye was a possible carcinogen. That is what I was told, who knows if that was the truth? But it takes the love out of all of those valentine heart-y cakes doesn’t it? April 10th, 2012 Extra-Ordinary: The best red velvet cake ever made. Followed by 10+ other samples at the show. Sometimes you just have to be first – not the best. PS Well Fed does not purchase anything already pre-made but makes everything from mostly scratch. Yes, they buy some things pre-prepped, but that is just good business sense! I ate something today that should not exist. It is against the universe. Anyways, the scene was something like that. I liked it. I took it to heart. I’ve used the concept it many times over the years to get over stuff. Smart = Not gorgeous. Cheap = Short Life. Glorious 1969 Barracuda = Gas Guzzler. Artist = Tortured. Fresh White Bread = Calories. It’s the way of the universe. Parents use it all the time to cheer up sad children. (“Little Johnny, I know that you are terrible at sports, but you are great at math. Everyone can’t be good at everything, honey. You’ll see – that’s why I put up with your father.”) It is a construct that we use to make sense of an unfair world. Well, today I ate Tofu Shirataki Angel Hair Shaped Noodles. What is this? Well, it is noodles made with tofu and yam flour. It comes a sealed bag with the noodles floating in liquid (presumably water). We used it for our Annual Easter Pad Thai dish. Nothing says easter like Pad Thai. We have tried many iterations to reduce the calories of Pad Thai, the problem is that white rice noodles are high in calories and do not fit in Damn You Fit April. Low Carb pasta is pretty good but the calorie count is high still. The broccoli slaw worked okay, but kinda made Pad Thai into a vegetable stirfry. This product contains no GMOs (genetically modified organics), no cholesterol, little to no fat, no preservatives, is gluten-free, is vegan, has only 1 net carb (for those of you who know what the means), 2 grams of fiber and 1 gram of protein. You can get in macaroni noodles and other shapes. It is reasonably priced – 226 for $2. And the kicker?? It has only 20 calories per serving. And the serving was normal sized: 113 g. You could eat 5 servings and only 100 calories (that is only 10 minutes of running people!). Don’t you hate those types of products that tell you the serving size is something like 58% of the package? Really? Like I am going to buy a “single” serving Iced Tea bottle and only drink 3/8 of the bottle and then put it in the fridge for tomorrow. Nobody does that. And if you do, I don’t want to hear about it. I digress. But back to this seemingly miracle food. What is the price? What is the trade-off? The universe must balance out. Well, the package does have the ominous directions of “Boil for 2-3 minutes (or microwave for 1 min) to reduce the authentic aroma”. Huh? And this is true, it smelled like Shrimp Mr. Noodles. But, after draining, rinsing and microwaving for 1 minute, the smell had dissipated. Then noodles looked fragile, they will probably fall apart in the stir frying process. Nope, they stayed true to form. Surely, they will taste weird. Nope, tasted pretty much like noodles. Do little children work to their fingers bleed to make these? Are they cutting down the rain forest to plant soy beans? Do I want to know? April 8th, 2012 Extra-Ordinary: The best Easter Pad Thai yet. Nervously waiting for the universe construct to right itself. And don’t even get me started on the PB2 powder sprinkled on top of the Pad Thai used in place of the peanuts.